If you’re already read my recently posted More Than Music column, you have a pretty good idea why I will always have a strong emotional connection to Reflection Eternal. And like many of the duo’s fans, I’ve been waiting and waiting for a true follow-up to their classic Train of Thought, while secretly believing that it’ll never actually happen. 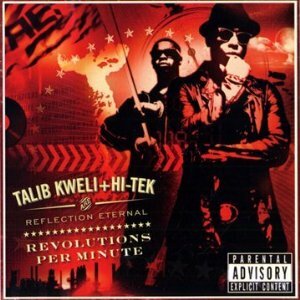 Fortunately, for the people out there that still believe in (and appreciate) the presence of craft and artistry in their hip-hop, May 18, 2010 saw the triumphant return of Talib Kweli and DJ Hi-Tek with Revolutions Per Minute. Obviously, the first question from you is likely this—how does it measure up to the incredible high standard set by their previous collaboration, which I’ve deemed not only one of the best albums I’ve ever had the pleasure of experiencing, but one of many important elements that combined to create one of the best years of my life? After a melodic intro that quickly explains the meaning of the album’s title, and discusses some of the immense changes that have occurred in the music industry since the last Reflection Eternal release, it’s not long before things hit full stride on the track Back Again, whose chorus proudly announces “That’s right, we back again/You can like rap again/You can say that again.” This refreshing bit of sentiment carries us throughout the entire album, as it weaves through a variety of jazz-tinged, soulful backdrops from Hi-Tek, which allows Kweli to once again display his unquestioned lyrical prowess and versatility. Both of them have achieved great success separately, or with other collaborators, but there’s always something extra special when they come together, and Revolutions proves that will always be the case. Recommended for any and all Reflection fans (obviously) and even those that are curious what all the fuss has been about this past decade. Then after you do that, please do yourself another favor, and find Train of Thought, which has lost almost none of its brilliance and overpowering excellence. Any guesses as to how long we’ll have to wait for a third album…?